Submitted by Alexander Briones on Jul. 24, 2018. Originally published on June 27, 2017 and last updated on July 25, 2018. A guitar rig is only as strong as its weakest link, so it pays to get the right patch cables for the job. Here we present you what the market considers to be the best guitar patch cables, covering a variety of price ranges and bundles - updated for 2018. Our list of recommendations includes detailed descriptions of each one, along with noteworthy feedback from real world users. Also included are top-rated guitar pedal couplers, to provide you with a cable-less approach to linking pedals together, along with a market favorite DIY solderless patch cable kit, if you want more control over the specific lengths of each patch cable. With ever increasing demand for space saving pedalboards, manufacturers are racing to build the smallest pedals and even patch cables. The EBS PCF-DL10 joins this arms race for pedalboard space with its flat cable and right angle plugs. With its compact profile, positioning pedals and patch cables are easier, and reduces unwanted clutter. But it's not just about being compact because the EBS PCF-DL10 is currently the top rated patch cable in the market, beating out those from more popular brands by a small margin. 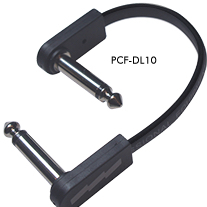 Plug: Flat Right Angle 1/4"
Market response to the EBS PCF-DL 10 continues to be overwhelmingly positive! With many claiming that it is the best patch cable that they have ever tried. Most users commend it for its quiet operation, while others rate it highly because of its space saving form factor. Reliability and build quality are two other traits that gets a lot of thumbs up. There aren't any noteworthy or consistent complaints, other than a few users who wish that it was available as a cable kit - so they can customize the length of the cables. Thankfully the EBS PCF-DL10 is available in other length variants, so you can achieve a cleaner look with careful planning. With its incredibly high ratings and good price tag, the EBS PCF-DL10 gets our top recommendation. Mogami Gold Guitar Patch Cable 18"
Most discussions about premium quality cables end up mentioning Mogami at one point. So it is not surprising to see the company joining this list with the Mogami Gold Patch Cable, bringing over the same reliability and transparent sound as their popular Gold series of regular sized cables, only this one is shorter and features two right angle plugs for easy setup. Like its longer siblings, each Mogami Gold patch cable features OFC (Oxygen-Free Copper) that is wrapped in double shielding that includes a high density spiral shielding, and conductive polymer sub-shield. Finally, both right angle plugs feature gold contacts. The response to the Mogami Gold patch cable is overwhelmingly positive, with many pointing towards its quiet operation, reliability and lossless sound as its best traits. And its not just the average guitar guy that's impressed because even pros like Richie Kotzen, Laurence Juber and others trust the quality of Mogami made cables. There were some who found the toughness of the cable to be a bit overkill, limiting its flexibility, but this is a minor issue since patch cables are usually set in place for a long time anyway. With its impressively high rating, the Mogami Gold patch cable is very easy to recommend, especially for those who are willing to invest in premium gear. The PG-10 Premium Gold is another highly rated patch cable from EBS Sweden. The name itself is an easy giveaway of its main feature, which is the use of premium 24-karat gold plating on the contact housing and 1/4" plugs, both of which add to its overall look and performance. The EBS PG-10 also comes with a flat profile cable and flat right angle plugs, which makes this patch cable easier to position, and if implemented properly, can save you some precious pedalboard space. The first thing that most users appreciate is the EBS PG-10's compact profile which opens up space. Many also describe the flat cable design to be very easy to work with, cutting down setup time and cable checking/maintenance by a considerable margin. Some even go as far as recommending the EBS PG-10 over more expensive cables that they have swapped out. There are very few complaints to worry about, and the few that it gets are from ill-prepared users who find out that they need one with longer cables - and this is quite unfortunate given that longer versions of this patch cable is available. Whether or not you fancy its gold aesthetics, the EBS PG-10's high ratings warrants a closer look. 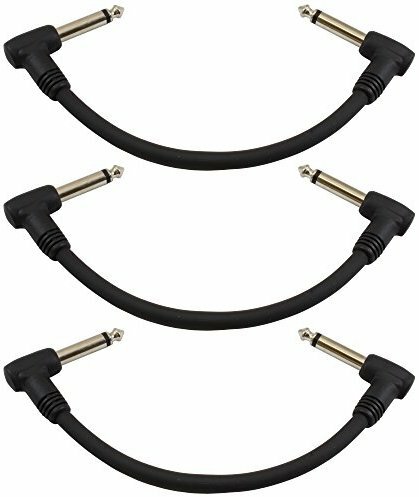 The GLS Audio Patch Cable 3-Pack is the cheapest to make the list, but it's not just about affordability because it continues to get high ratings - high enough to make the cut in this short list. This is a straightforward bundle, just 3 pieces of 6" patch cable cords with right angle plugs. But what makes it stand out is its reliability and simplicity, which ups its value for money further. This reliability and simplicity is achieved via its molded plug design, which makes for a stronger structure at the cost of being harder to repair. A lot of users were surprised at how well these cables performs, specifically commending their quiet operation, which is impressive for its price point. Some even found it to be more transparent and noise-free than more expensive cables. There were some who complained about the right angle plug being bulky, especially when used on smaller boards. Still, it is a great buy, especially for those who are looking to setup a pedalboard without spending too much on patch cables. 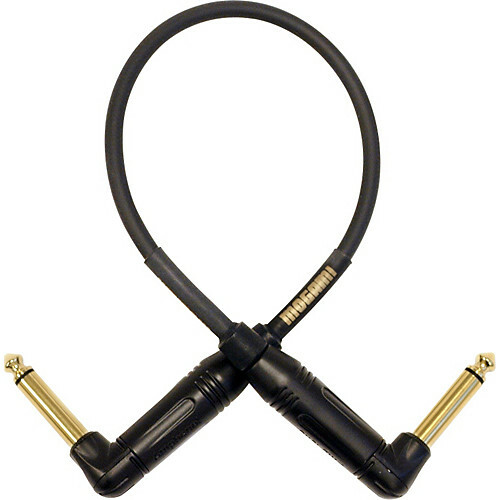 Hosa IRG-101 Guitar Patch Cable 12"
The Hosa IRG-101 patch cable continues to win over guitarists world-wide with its distinct low-profile plug design. The thinner profile of the plug lets you save on precious pedalboard space, and makes setup a bit easier. And since it's made by Hosa to be affordable, buying them in bundles will not hurt your budget as much. These plugs are also configured to be user serviceable via soldering, which extends longevity and value for money even further. Many users are pleased with the space they save by using this patch cable, especially when using smaller pedalboards where every inch counts. It is also commended for its cable flexibility, which is important when setting up pedals, and more importantly many feel that they got more than what they paid for in terms of quality. Still there are a few who have experience with premium cables that were not impressed with its build quality. Keep in mind that the thin "pancake" style plug is a bit wider than usual, so it may block jacks that are close to each other, like on some stereo output pedals. If you're looking for an affordable patch cable for your small/nano size pedalboard, then get the Hosa IRG-101. Fender's Performance Series Patch Cable continues to receive high ratings and recommendations. This patch cable is thicker than many at a 0.31" diameter, with two right angle 1/4" plugs and a flexible PVC jacket that protects the inner conductor and prevents cable memory and kinking. It also features 90% OFC spiral shield for interference free operation. Most of the users were satisfied with the Fender Performance Series Patch Cables' performance, with some even using adjectives like "excellent" and "perfect". Many found the cable to have just the right balance of flexibility and strength for easy setup and maintaining their position on the board. There were some users who wanted more colorful options, while there were a few who found the cable to be little too stiff. Other than those, the response is generally positive and well worth the extra investment compared to cheaper alternatives. Pedal couplers are simply two plugs connected back to back, removing the need for any cabling. 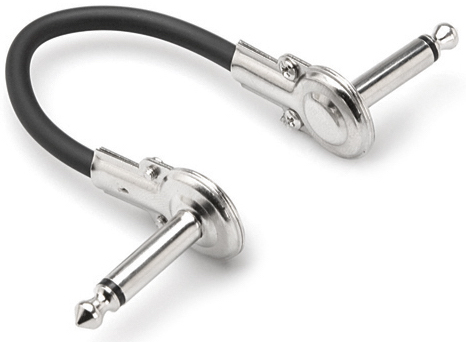 They are ideal for linking pedals together that have similar input/outport jack placements. 88 out of 100. Incorporating 375+ ratings and reviews. The Mooer PC Z coupler is designed to simplify the setup of multiple Mooer pedals with its two 1/4" plugs which are directly connected to each other in a "Z" shape without a cable component. Since it doesn't use any cable, signal quality and stability is improved, and it also saves considerable space. On the flipside, it does restrict pedal placement to match its Z profile. But it does work really well with similar size/configuraiton pedals, or with pedals from the same brand, even more so when used with Mooer pedals. Simple and effective are two adjectives that users use to describe the Mooer PC Z coupler. Build quality and signal reliability also gets a lot of thumbs up. There are a few who caution that stepping on a pedal can sometimes cause strain on the plugs if the pedals are positioned improperly. So do take the time to get the pedals properly lined up before taking them on stage. This Z shape coupler is ideal for minimalist pedal users, especially those who use Mooer pedals. The Creanoso pedal coupler is as straightforward as it gets, just two 1/4" male plugs connected back to back so you can save as much space as you can on your board. The obvious downside of this design is that it will only work if the pedal jacks are of the same height and aligned properly, which limits its use. Still it is quite practical to have, especially since it is affordable. It is expected to work well with pedals of the same make and configuration, like those from Boss, Mooer, DigiTech, TC Electronic and more - as long as the pedal jacks you want to connect are aligned. It can also be used sparingly in conjunction with patch cables, so you are not too limited by them, and still benefit from its simplicity and space saving design. The Creanoso Guitar Pedal Coupler is well received for its practicality. Reviewers are happy with how it opened up their pedalboards, some even had enough extra space for another pedal. Other reviews also commend its solid feel, which lets you make music without worrying about the connectors. Because the space between pedals are drastically reduced, there is an increased chance of hitting wrong pedal switches. Those with wide feet will also want to stay clear of this coupler, unless they have ballerina like precision to avoid stepping on two switches at once. Even with its limitations, its practicality and affordability makes it a good tool to have for any pedalboard user. The Lava Tightrope Solder-Free kit makes their brand of quality available for pedalboard owners who want to use custom sized patch cables. It features 10 feet of their Ultramafic solid silver plated 20 gauge cable (32 pF/ft capacitance), which you can cut to your preference. The cable is paired with 10 right angle plugs, all of which allow for convenient solder-free connectivity. So with this kit you are getting up to five Lava quality patch cables to get your pedals connected. Ease of setup are consistently mentioned in reviews, even those with experience in making patch cables are impressed with how convenient this kit is. Build quality of the plugs and cables are also highly regarded, to the point that some notice improved clarity in their overall sound. There are a few who find that the 10' cable is not enough for their pedalboard, so you'll have to do the math properly to know if you'll need to buy two kits or more. Some users also caution that getting the cable inside the plug properly is important. Unfortunately, there are some users who improperly rate this kit lower due to problems that they themselves caused due to mistakes or lack of experience. If you're looking for a premium patch cable that you can custom cut to your preference then the Lava Cable Tightrope Solder-Free Kit is for you. Patch cables come in different lengths, usually 6", 12" or 18" long. Since they are pre-cut to specific lengths, it is best to plan and measure the position of your pedals prior to selecting the right sizes. 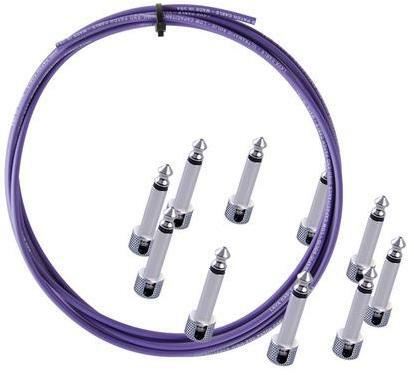 Patch cable kits like the one we recommend above are ideal if you want to have detailed control over how long each patch cable should be on your board. We've also included pedal couplers in this list in case you're connecting pedals of the same maker to save even more space. Many patch cables are available in bundles, and most of the time they are cheaper to buy compared to when buying them one by one. We also recommend keeping a few spare patch cables, for quick swapping out of bad cables. Most patch cables come with right angle plugs because they conveniently connect to the side and saves space. There are also thin-profile right angle plugs that allow you to position pedals closer to each other. Note that right angle plugs can block ports that are positioned close to each other, so do look out for those when planning your pedalboard. 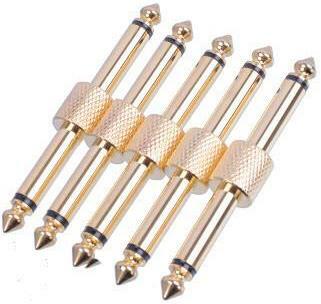 You'll notice that some cables have gold-plated tips, this is because of gold's inherent corrosion resistance. Nickel or chrome plugs corrode faster when exposed to humidity, and is often the reason you hear crackling noise on plugs with older tips. The cable jacket serves as the cable's outer protection and is usually made of sturdy yet flexible PVC. On the inside of the jacket, the copper conductor is wrapped in a special "shield" that blocks interference. Foil shielding is the most affordable, but it offers the least protection. Reliable cables usually come with Braid shielding, because of its inherently flexible and sturdy design, while blocking more EM (Electro Magnetic) and RF (Radio Frequency) interference. Since patch cables don't move around much, they don't get as beat up as the cables that you plug to your guitar. Still, it pays to get ones that are durable in case you misstep on them, or when pedals become loose during transport or while performing. Patch cables are usually expected to be discrete looking because pedals are the stars on pedalboards, but there are a few who want their patch cables looking a certain way. And if you think aesthetic qualities inspire you to play better, then invest in good looking ones. We first looked at all the top rated patch cables that are available on the market, and gathered relevant reviews and ratings. For this 2018 update, we ended up with over 4900 rating sources which we processed with the Gearank Algorithm. The resulting scores were then used to narrow down the list to just the cream of the crop. We've also decided to process the scores of pedal couplers and solderless patch cable kits that are doing well in the market, and picked the best ones from them to give you more options to choose from. For more information about our methods, see How Gearank Works. Submitted by Eric Johnson (not verified) on Jul. 5, 2018.